Hunger—the kind that first-world, non-impoverished people experience—is dull. You’d eat anything when you’re hungry. Food nostalgia is both hyper-specific and vast; it’s not just a craving for a specific flavor but also its context. Hunger can be temporarily ignored; nostalgia is insistent. And having spent my December holidays back in New Jersey, I’m not just hungry but fiercely pining for a slice of my home state’s Sicilian pizza. Sicilian slices are by definition square and thick and doughy. After that, it’s all details. Sicilian slices are not Detroit pan-style pizza, though perhaps they’re cousins, because Detroit pie’s crust is crispier, the result of its baking in thick, almost cast-iron pans. Sometimes Detroit pies have cheese in the crust, or they may be baked twice. Sicilian pies are doughier, like a saucy bean bag chair—no special dough, no special seasonings, no cast-iron char. The slices I remember—and they were always square slices, because while you can buy a whole Sicilian pie, you’d better have an entire family to feed, with a desire for leftovers—came mostly from the now-closed Dipaolo & Sons Bakery in Union, my hometown. Dipaolo was primarily a bakery, but its Sicilian slices were a cult favorite (I was glad to find likeminded fans in the still-preserved Yelp reviews). My family visited Dipaolo after church on Sundays, stocking up on danishes, rolls, the cookie bribes that motivated me to sit still during Mass, and sometimes, a Sicilian slice for lunch. Its warm, doughy base yielded easily to my small teeth, the layers of bread and cheese and herbed tomato sauce slowly compressing like sand-art layers into one squishy bite. Surely there must be more magic to Sicilians’ appeal than the mere alchemy of dough, cheese, and sauce. Arguments about the best Neapolitan pizza or thin-crust slice invoke water chemistry and dough rises and geographically designated tomato varieties. So I call Frank Scaturro, co-owner of family-owned Lodi Pizzeria in Lodi, New Jersey, in business since 1970 and often in the discussion of best Sicilian slices in the state. I expect to hear a hallowed family secret or some wizened metaphor about dough and sauce ratios. I try to press on, but to no use. His mostly one-word answers were perhaps a metaphor for the pizza he serves: straight-forward, no nonsense, simple. What you see is what you get, and what you see is an inch-thick dough covered in cheese and sauce. Snobs might say Sicilian pie lacks textural contrast. They’re not wrong. But what Sicilians lack in crunch or char, they make up for in the carb-and-fat interplay proven to turn your brain’s pleasure centers into a neon disco. Toppings aren’t a crucial part of Sicilian pies’ DNA. Anything you can slap on a regular pie, you can slap on a Sicilian. I usually keep it simple, though, because a Sicilian already has heft, muscle—no sausage required. Jersey-style Sicilian pizza isn’t so much about regionally specific toppings, the way clams are to New Haven pizza. 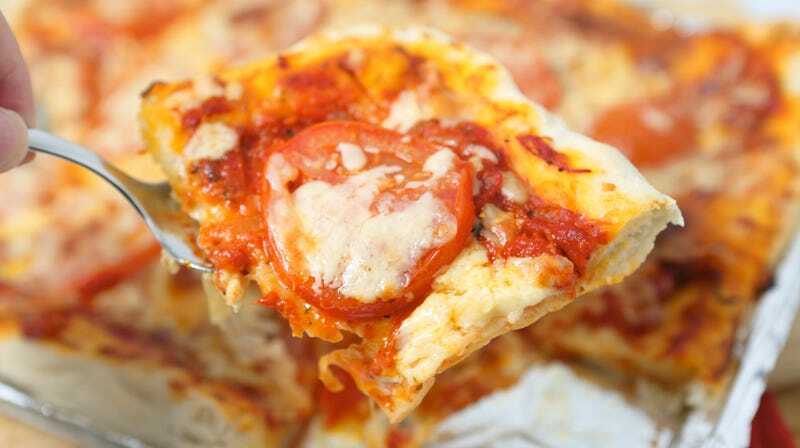 Below its cheesy blanket, a focaccia-like mattress delivers the most important of Sicilian elements: the sauce. Having eaten his weight in pizza around the greater New York City area, Genovese says he’s noticed some taxonomic distinctions between the region’s Sicilian landscape. First, Jersey remains the capital of the Sicilian universe (“I can’t remember going to a neighborhood pizzeria in New Jersey and not seeing Sicilian”). In Long Island, however, you’re more likely to see Grandma slices, a pared-down, thinner-dough version of Sicilian. New York pizzerias do Sicilians, too, but Genovese finds them less saucy than their Garden State counterparts, a knock against them in his book. North Jersey remains Sicilians’ geographic epicenter, though Genovese’s favorite slice comes from central Jersey’s Brooklyn Square Pizza in Jackson, N.J., a town whose claim to fame prior to the award-winning pizzeria was Six Flags Great Adventure. As Genovese ticks off his other favorites—Bruno’s in Clifton, and two stalls (Kate’s; and Pete and Al’s) in the Columbus Farmers Market—I further despair at the realization that unless I book another pricey plane ticket back East, I’m not likely to see a decent Sicilian for months. I attempt self-consolation, mixing metaphors in my haste and longing: Kate, there are plenty of pizzas in the sea. Why not a nice Neapolitan? A crackery, foldable thin-crust? I can appreciate other styles of pizza; in fact, I objectively acknowledge that a thin-crust pizza is a superior form of the art, what with its subtleties and balance and textural intrigue. I don’t even think I’d proclaim Sicilian my favorite style, bar-none. But nostalgia is a laser beam. It wants what it wants; it will accept no substitutes. Right now, it wants to blast my taste-memory back in time to the years when I was unconcerned with questions of crust texture and dough rise and the authentic provenance of San Marzano tomatoes. It wants a giant, saucy square of cheese-covered squish, malleable enough to fit a deep-down, homesick gap.